A time study is generally conducted with a stopwatch, either on the job site or by analyzing a videotape of the job. Procedural, the job or task to be studied is separated into measurable parts or elements, and each element is timed individually. After a number of repetitions. the collected times are averaged. 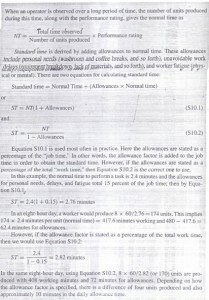 (The standard deviation may be computed to give a measure of variance in the performance times.) The averaged times for each element are then added together, and the result is the observed performance time for the operator. However, to make this operator's time applicable to all workers. a measure of speed. which is expressed as a performance rating and which reflects how hard the observed operator is working. also must be included to "normalize" the job. The application of a rating factor provides what is called normal time. 60/2.82 = 21.277 pieces per hour is the standard. $12.00 per hour/21.277 per hour = $0.564/piece. Thus. 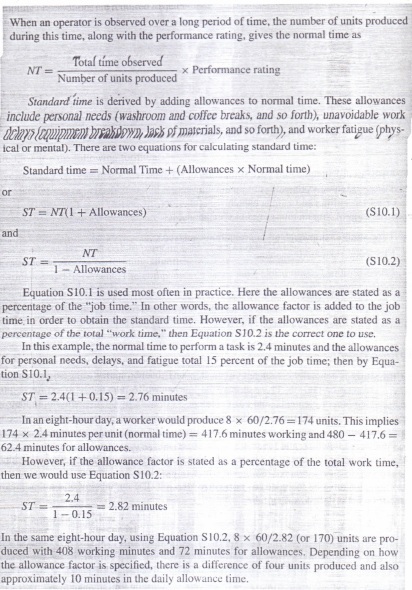 a person working at 100 percent of standard would earn $12.00 per hour; a person working at 110 percent of standard would earn $13.20 per hour major problem with the piece-rate system is that it tends to reward quantity at the ex- sense of quality. A.sa result, firms that have adopted the niece-rate system usually will only for good pans that are produced. Before a time study is conducted. each task is broken down into elements or parts. Some general rules for the break down of a task are I. Define each work element to be short in duration but sufficiently long enough so that each can be timed with a stopwatch .a.nd the time can be written down. 2. If the o operator works with equipment that runs separately-the operator performs a task and the equipment runs independently-separate the actions of the operator and that of the equipment into different elements. 3. Define any delays by the operator or equipment into separate elements. How many observations are enough? Time study is really a sampling process; that is, we take a relatively small number of observations as being representative of many subsequent cycles to be performed by the worker. A great deal of analysis and experience indicates that the number of observations is a function of cycle length and the number of I repetitions of the job over a one-year planning period.